Patagonia is a remote region, roughly 1500km south of the nearest capital cities, Santiago and Buenos Aires, one of which will be your point of arrival if travelling internationally. There are over a dozen smaller airports throughout Patagonia, but flights to and from them don't cross the border. To get to Patagonia from outside of Chile and Argentina, you need to fly into either Santiago or Buenos Aires and then take a connecting flight down to Patagonia. If you want to travel to Chilean Patagonia, fly into Santiago International Airport (SCL) (officially called Comodoro Arturo Merino Benitez International Airport) in Santiago, Chile. Need inspiration of what to do in Santiago? To travel to Argentine Patagonia, you need to fly into Ezeiza International Airport (EZE) (officially called Ministro Pistarini International Airport) in Buenos Aires, Argentina. Want to know what to do in the Paris of South America? While international flights arrive into EZE, many flights on to Patagonia leave from Aeroparque – Jorge Newbery (AEP), the domestic city airport. When arranging your travel it is therefore important to factor a few hours’ connection time. From Buenos Aires you can fly to: Ushuaia (3 hr 30 min), El Calafate (3 hr 15 min), Bariloche (2 hr 30 min), Tierra del Fuego (Rio Grande) (3 hr 30 min), Puerto Madryn (2 hrs), Puerto Pirámides (2 hrs), and Rio Gallegos (a 3 hour 30 min drive to Puerto Natales) (3 hr 15 min). Domestic routes include: El Calafate to Bariloche (1 hr 45 min) and El Calafate to Ushuaia (1 hr 20 min). If you’re exploring Chilean Torres del Paine, you’ll find that flights to Puerto Natales are either non-existent for your travel dates, or few limited/expensive. Punta Arenas Airport (PUQ) operates as the most popular for getting to the park at this time, from here it is a 3 hour bus journey to Puerto natales and then an additional 2 hours into the park. From Santiago flights include: Punta Arenas (3 hr 20 min), Puerto Montt (2 hrs), and Balmaceda (2 hr 20 min). Domestic routes include: Punta Arenas to Puerto Williams (1 hr 15 min) and Puerto Montt to Punta Arenas (2 hrs). The interactive map below shows the locations of the key airports which are useful for accessing the varied regions of Patagonia. Open it in a new tab to help you plan your journey. It is important to make sure that you fly into the same country that your destination is in. For example, it would be difficult to get from Buenos Aires to an airport in Chilean Patagonia. British Airways now operate a direct flight from London Heathrow (LHR) to Ezeiza airport (EZE) in Buenos Aires, which takes 13-14 hours. Indirect flights, via Madrid, the USA or Brazil will probably work out cheaper, but do add a few hours to your journey and add some risk around connections. You can now fly directly from London Heathrow (LHR) to Santiago (SCL) as well as flying via Madrid, which makes for a relatively smooth and quick journey. USA to Buenos Aires - There are flights from several of the larger airports in the USA, either direct or with a stop. Below we've listed flights from some major cities, but we're more than happy to help you find and book a flight from anywhere else in the United States - just get in touch. New York, NY - American Airlines fly direct from John F. Kennedy International Airport (JFK) once a day, with flight times of approximately 10 hours 35 minutes. Miami, FL - There are several daily direct flights from Miami International Airport (MIA) which take around 9 hours. American Airlines fly 2 to 3 times per day, and LAN Airlines once a day. Dallas, TX - American Airlines have one direct flight each day from Dallas/Fort Worth International Airport (DFW), with a flight time of about 10 hours 20 minutes. Atlanta, GA - Delta Airlines operate a direct daily flight from Hartsfield-Jackson Atlanta International Airport (ATL), which has a flight time of around 9 hours 35 minutes. USA to Santiago - There are flights from a number of major airports in the USA to Santiago, either direct or with a stop. Details of flights from some cities are listed below, but we're happy to help you find and book flights from anywhere in the United States - just get in touch. New York, NY - LAN Airlines fly direct to Santiago avery day from John F. Kennedy International Airport (JFK) , with a flight time of approximately 10 hours 55 minutes. In addition, there are around 3 flights a week which stop once at Jorge Chavez International Airport (LIM) in Peru. These flights are operated by LAN Colombia and have a total journey time of just over 13 hours. Los Angeles, CA - There is a daily flight from Los Angeles International Airport (LAX), operated by LAN Airlines. These flights have one stop at Jorge Chavez International Airport (LIM) in Peru, and the journey takes around 13 and a half hours in total. Miami, FL - There is a daily direct flight from Miami International Airport (MIA), operated by American Airlines, with LAN Airlines also flying direct up to twice a day. The flight times are approximately 8 hours 30 minutes. Dallas, TX - American Airlines fly direct once a day from Dallas/Fort Worth International Airport (DFW). The flight takes around 9 hours 40 minutes. Atlanta, GA - There is a direct flight operated by Delta Air Lines, which flies daily from Hartsfield-Jackson Atlanta International Airport, with a flight time of approximately 10 hours 10 minutes. Australia to Buenos Aires - There are no direct flights to Buenos Aires. The most efficient way to make this journey is to fly to Santiago and then take a connecting flight to Buenos Aires. Flights from Santiago (SCL) to Buenos Aires (EZE) are regular and take around 1 hour 55 minutes. From Sydney, you can take a flight direct from Kingford Smith Airport (SYD) to Santiago. Qantas operates this flight around 4 times a week, with a flight time of approximately 12 hours 40 minutes. From elsewhere, you'll either need to get to Sydney and then fly Sydney to Santiago to Buenos Aires... or it may be more convenient to fly to Auckland, NZ to Santiago to Buenos Aires - LAN Airlines fly direct from Auckland International Airport (AKL) to Santiago once or twice a day in around 11 hours 45 minutes. Australia to Santiago - From anywhere in Australia, you should be able to fly to Santiago with at most one stop. From Sydney, there are direct flights 4 times a week from Kingsford Smith Airport (SYD), which is operated by Qantas and takes approximately 12 hours 40 minutes. From elsewhere, one option is to get to Sydney and then fly direct from Sydney, as above... or, if it is possible for you to fly to Auckland, NZ, you can fly Auckland to Santiago - LAN Airlines have direct flights once to twice daily from Auckland International Airport (AKL), with a flight time of about 11 hours 45 minutes. Canada to Buenos Aires - It's possible to fly direct from Toronto to Buenos Aires, but not from elsewhere. From some areas of Canada, it will be most efficient to travel to Toronto and fly direct from there, while from others you could fly with a stop in the USA. From Toronto - Air Canada operates a direct flight 5 times a week from Pearson International Airport (YYZ), with a flight time of around 13 hours 50 minutes. Canada to USA to Buenos Aires - for this option, take a look at how to get to Patagonia from the USA. If it's not clear how to get down to Buenos Aires from your part of Canada, do get in touch and we'll be happy to find and book flights for you. Canada to Santiago - There are direct flights from Toronto, but from elsewhere in Canada, you'll either need to first travel to Toronto or take a flight which stops in the USA. From Toronto - There are 5 flights a week direct from Pearson International Airport (YYZ) to Santiago. The flights are operated by Air Canada and take approximately 10 hours 40 minutes. Canada to USA to Santiago - for this option, take a look at how to get to Patagonia from the USA. If you're unsure how best to get down to Santiago from your part of Canada, don't hesitate to get in touch so we can help you find and book flights. New Zealand to Buenos Aires - There are no direct flights to Buenos Aires. 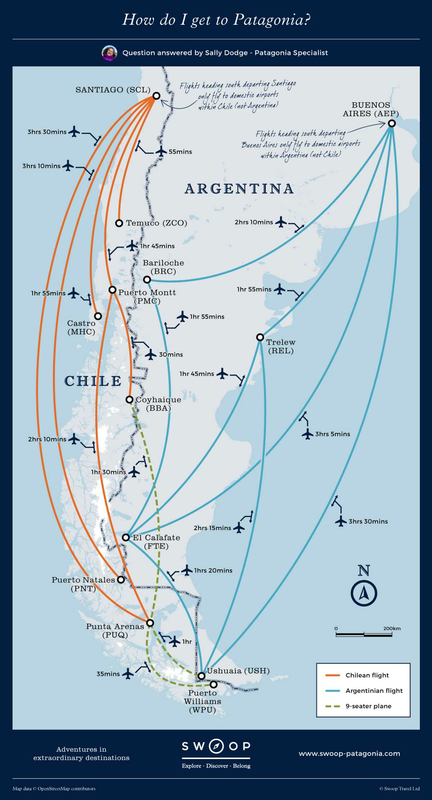 The most efficient way to make this journey is to fly to Santiago and then take a connecting flight to Buenos Aires. Flights from Santiago (SCL) to Buenos Aires (EZE) are regular and take around 1 hour 55 minutes. From Auckland - LAN Airlines fly direct from Auckland International Airport (AKL) to Santiago once or twice a day in around 11 hours 45 minutes. Then you'll need to take a connecting flight to Buenos Aires. From elsewhere - First travel to Auckland, then you can fly Auckland to Santiago to Buenos Aires, as above. New Zealand to Santiago - You can fly direct to Santiago from Auckland. From anywhere else in New Zealand you'll need to first travel to Auckland. From Auckland - LAN Airlines have direct flights once to twice daily from Auckland International Airport (AKL), with a flight time of about 11 hours 45 minutes. However, some nationalities may be required to pay a reciprocity fee. Make sure you book your regional flight with the same company as your international flight. We got stranded both ways due to delays and since they weren't with the same company, they would not work together to get us there without a charge. The only slight difficulty I had was trying to find a working cash machine, especially in El Calafate. There were also limits on the amount of cash you could withdraw so I would advise / warn people to pay online in advance as much as possible, and to bring some cash with them. We can help you work out the best itinerary, or decide which regional airports will serve you best. My initial enquiry to Swoop was about Torres del Paine but after their suggestions to me for other activities, I had a 5 week adventure which could have easily extended to double that!